BackRex Outlook Backup is a backup and restore tool for Microsoft Outlook, Internet Explorer and Mozilla Firefox. It allows you to save your current configuration and Outlook data (mail folders, address book, account settings, tasks, notes, calendar, journal, contacts, signatures, stationery, message rules, and all custom preferences). In addition, BackRex Outlook Backup saves all Internet Explorer settings, including favorites, history, proxy settings, fonts, etc. BackRex Outlook Backup can help you to migrate or transfer Outlook settings and data from one computer to another, even with different version of Windows and/or Outlook (for example from Outlook 2003 to Outlook 2007). How does it work? 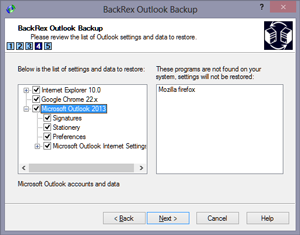 Install and run BackRex Outlook Backup on the computer from which you wish to save the Outlook settings and data, then choose the Backup option, and finally choose a folder to save all the data in. When BackRex Outlook Backup finishes, keep the results in a safe place - you'll need them to restore your Outlook data. To restore, run BackRex Outlook Backup from the folder from which you have saved the Outlook settings and data, and in a few minutes all your personal information will be restored.